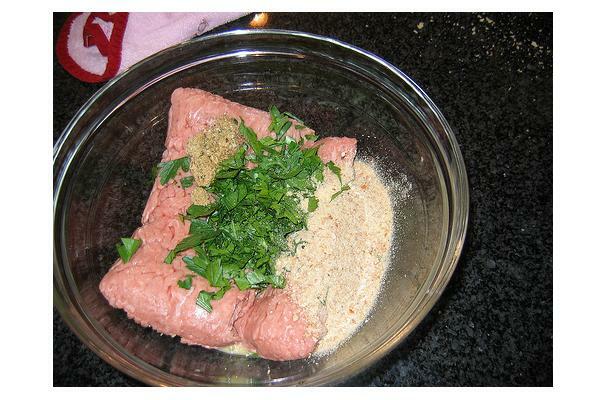 Ground turkey is made from finely chopped up pieces of turkey and is often used to make burgers or chili as a low-fat alternative to ground beef. Ground turkey can be all white meat from the turkey breast, all dark meat from the legs and thighs, or a combination of the two. The white meat is very lean, which makes it lower in calories and fat, but can also result in dry burgers or meatloaf. For a more moist burger, use a combination of white and dark meat. Finely chopped pieces of dark and white turkey meat. Choosing: Some ground turkey are already prepacked in the supermarket. make sure it is properly packed or vacuum sealed. Always check for the "use-by" date. It is best to buy meat that is freshly ground. Always check for the color, make sure it is not pale or grayish in color and there is no foul smell when you open the plastic package. Buying: Buy only what you could use within 1 to 2 days. Make sure the portions are properly wrapped to avoid freezer burn. Freezer burn are the gray-brown spots on the meat caused by air reaching the exposed surface of the turkey meat. Follow the correct defrosting procedures if the ground turkey is frozen. Always remember to wash your hands, utensils and surfaces before and after handling raw poultry. It is also a good idea to soak in bleach or wash in the washing machine any towels and sponges that have been used to wipe up juices and water from the poultry meat. Cleaning: Meat that has already been ground up should not be washed. It has already been cleaned prior to grinding and this will only wash away any flavor on the meat. Repackage the ground turkey into smaller portions if you are not going to use them all at once.Store them in the coldest part of your fridge or in the freezer. It would be great if you could also label them so you can keep track on which to consume first. History: Ground Turkey existed since human learned how yo cook turkey hundreds of years ago.